Adelaide Law School scholars Dr Nengye Liu and Dr Michelle Lim have been visitors at the Institute for Environmental and Technical Law (IUTR), Trier University, Germany for most of December 2017. Dr Nengye Liu is currently conducting the German component of the project “Conservation of Marine Living Resources in the Polar Regions” at the Institute. The project is funded by the German Academic Exchange Service (DAAD) – the largest funding body in the world. 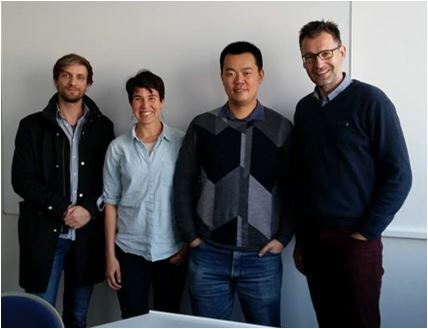 During his time in Trier, Dr Liu has had fruitful project meetings with German colleagues and in particular with project collaborators Professor Alexander Proelss and Valentin Schatz. While at the Institute, Dr Liu delivered a presentation addressing the European Union’s role in the South China Sea. The presentation was based on a paper by Dr Liu and co-author Xu Qi (University of Groningen). The paper was recently accepted for publication by Ocean Development and International Law, a leading journal in the field. Meanwhile, Dr Michelle Lim presented the paper: “Can the Sustainable Development Goals (SDGs) and International Law Understandings of Sustainable Development be Reconciled to Achieve Sustainability in the Anthropocene?”. The paper is being completed for submission during her visit to the Institute. This entry was posted in Events, News and tagged Dr Michelle Lim, Dr Nengye Liu, Germany, South China Sea. Bookmark the permalink.